Stunning Keisha: Wednesday Words—Every. Cats. Dream. Can I reach my Secret Paws gift from here? The peeps finally blinged up Doug E. Fir last Saturday. Thought you’d like to see it. We didn’t take many pics this year. HH Gutt: I bet you can’t climb to the top of the tree, CK. I will stand look-out for you. I made it! Do you climb your Christmas tree?? Oh look at that tree!!! it has a CK on it too!!!! Nice!!!! No I don't, but I might if *you* were at the top of it, my darling! Your peep's tree is pawsome! Have a wonderful Wednesday, CK. You are inspiring some VERY dangerous ideas for Waffles. ...if I'm lucky, he'll get caught!!! Doug is looking VERY beautiful! The tree looks great! Glad that's a photoshop picture. Knocked over trees can be a big mess! Ours got knocked over last year by sticky fingers ;) She's only managed to break one ornament so far this year. 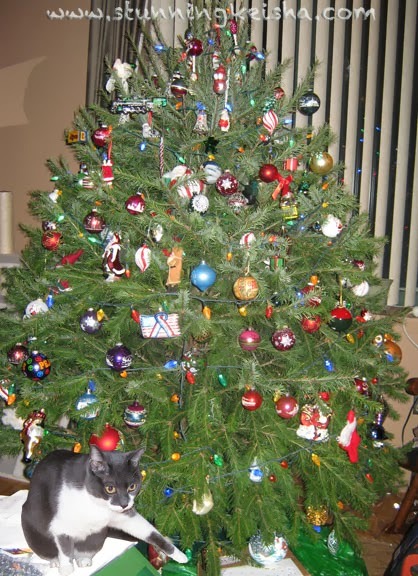 I am VERY embarrassed to admit that the few times we have had a Christmas tree, NONE of us has climbed it or knocked it over. Not even Binga. While none of us climbed the Christmas tree last year, some of us DID nom on the "leaves". Which is probably why we don't have a Christmas tree up this year. Fabulous tree. Have a wonderful Wednesday. That tree has some serious bling, but the best decoration is you, CK! We don't climb the tree when the head peep is looking, but she puts ornaments with bells that tell on us. I love your tree CK! Nope, I have never climbed our tree. Last year Silver climbed our tree MOL!! This year he's not so bothered and we have a full tree of baubles!! YEAH!!! Nope we've never tried to climb up the tree ever. What a good looking Doug E. Fir, CK. And yes, I climb our tree...without photoshop...but I've only made it to the middle and not to the top...yet. WOW - that is one gorgeous tree. I especially love the colored one, but it's pretty in the natural daylight also. Umm, CK, maybe you shouldn't try to climb it - Santa is always watching you know! Lol! Cats and trees, it's a terrible combination! :) By the way, great job on trimming the tree! You have a very beautiful big tree!!! Wow, what a gorgeous tree! CK, watch out for the Gutt! WOW CK.....lookie you at the tippity top of your tree...I'm impressed - most peeps put angels on top of their trees! Bravo. Your mountain climbing skills are impressive to be sure. The tree looks COMPLETE now! Now...any time is a good time to climb the tree. I am just waiting for mom to bring ours in. Jen doesn't put up a tree, because between Hissy Fit Jones and June Buggie, it's bound to come tumbling down! woo woo! I try and try to get to the top on our CATmastree m but I have to give up efurrytime because I get so wet ! LOVELY looking CATmastree at your house , it´s a real Disney CATmas tree !! What a great Catmus tree! 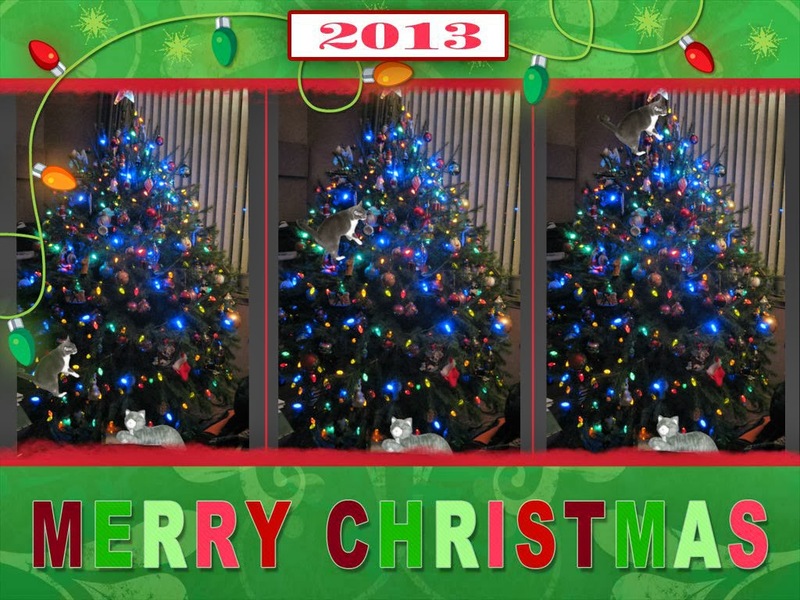 We did not gets the big tree this year...Jo-Jo is more than a little rambunctious so we has the little tree this year. Kozmo and Jo-Jo has knocked it over a few times already so Mommy is happy we went with the little tree. ME is not happy as my cat toys are NOT on it. We don't have a Christmas tree, but if we did, I'd be the one most likely to climb it, MOL. Hopefully we'll get one next year. That HH Gutt's kind of a troublemaker, isn't he? Next time I come over, I want to meet him, okay? Fish tacos? I'll be there in ten minutes. OMC, you're my hero! I will most defenetly try to do that! I hope I don't need photoshop for that. My staff has promised to bring the tree in today, I can't WAIT! !